Happy Friday everyone! Since it’s the end of the week, we’re continuing our look back at the fourth season of NBC’s Chuck with re-posts of reviews I wrote for YourHub last year. These “double-feature” reviews will continue to go up each Friday until the fifth (and final) season premiere on Friday, October 21st. Small alterations to the reviews have been made, but please keep in mind these were all written the night the episodes aired, so they may read as somewhat out of date (especially when I worry about the show getting cancelled, which didn’t happen). We continue today with episodes five and six, Chuck Versus the Couch Lock and Chuck Versus the Aisle of Terror. 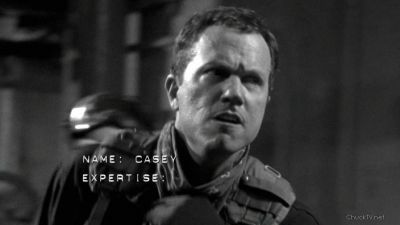 I’ve written at length before about how much I love the character John Casey; Adam Baldwin’s performance is absolutely perfect, and the writers have done an amazing job continually developing Casey from “gruff superspy” to “gruff superspy with a heart of gold.” Casey is one of the show’s greatest assets, period, and Chuck Versus the Couch Lock proved that the writers are still intent on exploring this funny, fascinating, and above all, incredibly badass creation. But this wasn’t quite the Casey-centric episode we were all expecting, because Couch Lock illustrated one of the most engaging aspects of Casey’s ever-evolving character: his unlikely friendship with Morgan Grimes, and in that way, this was just as much a celebration of all things Morgan as it was a 100-Ways-In-Which-John-Casey-Is-A-Badass extravaganza. I wouldn’t have it any other way. In fact, Chuck and Sarah took a backseat to the supporting cast this week, which is something we really haven’t seen since the show last had room to breathe back in season two. The first four episodes of the season all kept Chuck, Sarah, and their romance front and center, and while I think that’s a great element to center the story around, it was nice to take a week off and have fun with the equally engaging supporting players. Nevertheless, there were some really wonderful scenes between Chuck and Sarah this week, from seeing Chuck put his own awesome mission together to two wonderful romantic interludes, first when Sarah tried defusing the bomb and saving Chuck’s life, and later in the courtyard (or, as it should probably be rechristened, the ‘spot of romantic dénouements’). That gave Couch Lock a very balanced, organic quality—even while the episode’s main focus was on Morgan and Casey, enough attention was paid to Chuck and Sarah to keep the story chugging along seamlessly. It’s a little ironic, thinking back on it now, that the best creative result of Morgan finding out about Chuck’s secret was his hilarious pairing with Casey, first for training, then for mentoring, and finally for friendship. This relationship immediately became one of the show’s deepest comedy gold mines, but it also provided many trademark moments of warmth and humanity, like when Casey finally admitted that Morgan was a good friend in Chuck Verus the Role Models. Morgan is lovable because he loves everyone, even Casey, who had only ever been mean to Morgan, and that trait, in turn, has obviously warmed Casey’s cold heart. Tonight’s episode was the best showcase for their odd friendship so far, illustrating that, different though they may be, Morgan really is Casey’s best friend in the world, one of the few people he has a true soft spot for. Like I said, though, it is an odd friendship. So while we got Casey blessing Morgan and Alex’s relationship in the joyous, heartwarming closing, it took quite a bit of turmoil to get there. We all knew that Morgan would eventually have to confront Casey about dating Alex, and the physical ramifications of such an act, but the build-up to the moment was incredible. First, there was Morgan’s hilarious, seemingly improvised eulogy at Casey’s fake funeral (“…I called him ‘mitts…’”); since he failed to work up the nerve to break the news, we then got the second of Morgan’s three big hero moments of the episode: telling Casey the secret in order to shock him out of ‘couch lock,’ resulting in one of Casey’s most brutal—and riotously funny—strangulations ever. Adam Baldwin was excellent throughout the episode, as always, but he was especially funny in this scene, first expressing his anger through simple eye movements, then through brute force. Morgan’s had two other big hero moments, the first being his ‘break-up’ with Alex. Even though it all turned out okay in the end, it was still sad to see Morgan send Alex away to protect her from the bad guys—sad, and triumphant. In the short time he’s been a ‘spy,’ Morgan has come an awfully long way. Hurting Alex’s feelings to protect her doesn’t just show spy maturity, but an advanced emotional maturity Morgan didn’t have four years ago. I also doubt Morgan would have electrocuted himself to take out the villains back then, as he did in his third (and most obvious) big hero moment. Casey definitely met his badass quota tonight, but with the subtle and…*ahem* shocking heroics Morgan provided, Joshua Gomez stole the show. This episode summed up just how far Morgan has come in the last four years, and how he becomes more and more entertaining as he changes and matures. Every step of the way, Gomez has done a terrific job turning Morgan from simple comic relief into a classic, three-dimensional character, and tonight’s episode was one of his finest hours. This is also an episode that belongs in the Jeff/Lester record books; if Morgan’s maturation makes him increasingly lovable, then it’s Jeff and Lester’s ever-growing creepiness that makes them fan favorites. Their unsavory exploits are truly legendary at this point, epitomized tonight by their hilarious ‘rescue’ of Casey. I’m only wondering, at this point, when we’ll get to see another Jeffster! performance. Ellie and Awesome also got a few brief but memorable scenes, meaning that, apart from Big Mike, the whole cast appeared and was expertly utilized, a prerequisite of all great Chuck episodes. Some of the best Chuck episodes cram a lot into 42 short minutes, either from featuring multiple story and character arcs simultaneously or balancing all the humor, action, and espionage. Last week’s episode was a prime example of this quality, but this week’s installment proves that there is such a thing as too much, even for Chuck. Aisle of Terror contains two major stories: the return of Mama Bartowski and a ‘spooky’ Halloween adventure. Both stories had plenty of potential, but shoving them into the same episode left both plots undercooked and made for a disjointed, albeit fun hour. The return of Chuck’s mom was the stronger of the two stories, and was just about as compelling as one would expect it to be. Mary’s reunion with Chuck served as a perfect counterpoint to Steven Bartowski’s season two introduction; in both cases, first appearances were later proven wrong—Steven wasn’t just a crazy bum living in a trailer, and there’s clearly more to Mary’s story than she let on—but Steven was lovable and trustworthy from the start, no matter how many revelations came our way. Mary, on the other hand, is much more of an enigma, and as the puzzle of her back story begins to come together, the writers are clearly playing on our knowledge of Steven to trick us. Knowing his story and how easily we can, upon reflection, forgive him for abandoning his children, it makes us, like Chuck, want to believe Mary right from the start. But Mary isn’t Steven, and Linda Hamilton certainly isn’t Scott Bakula. That’s the point. Bakula’s warmth and likability made him a perfect fit for a role that required us to trust the man from the start. Hamilton, on the other hand, isn’t like that. Her ability to play characters walking the thin line between morality and darkness is what made Sarah Connor fascinating in Terminator 2, and it’s what makes Mary so intriguing here. By the episode’s end, we still don’t know where her allegiances lie, but there’s plenty of evidence for both sides, and Hamilton played the role ambiguously enough that, at this point, she could easily be a villain, a hero, or someone in-between. 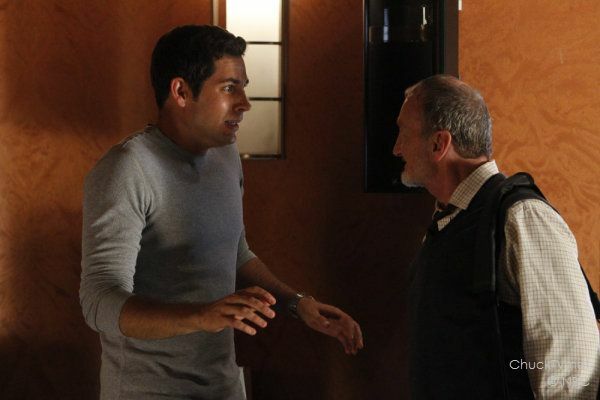 I loved all the twists and turns the story took, and it gave Zachary Levi, Yvonne Strahovski, and even Sarah Lancaster all great material to work with as Chuck, Sarah, and Ellie react to Mary’s return, but as compelling as this plot was, it was constantly undermined by the episode’s desire to simultaneously be a Halloween special. On its own, I think the Halloween material had potential. Robert Englund was fantastic as Dr. Wheelwright, finding the perfect balance between camp and menace that this type of villain needs. Wheelwright’s toxin was an effective threat, and the visuals for the toxin’s effects were, like Englund, equal parts funny and scary. There was plenty of great Halloween mayhem to be had, but when placed next to the more pressing matter of Mary’s return, it all felt more like a distraction, rather than a fun spy adventure. Not even Jeff and Lester’s titular “Aisle of Terror” could save things; it was more odd than funny, but I suppose that’s a risk worth taking when working with such strange characters. Not every episode can be a classic, after all, and even though the writers tried jamming a bit too much in for comfort, Aisle of Terror still managed to move the story ahead in interesting directions, and I’m guessing the plot threads established here will pay off in big ways down the road.